In the April issue of DIGITAL PRODUCTION we got a six-page article published, detailing the work we did on Underworld: Awakening. 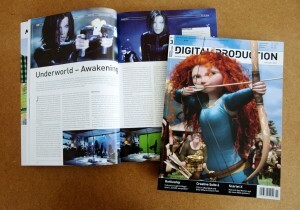 Celluloid’s VFX Supervisor, Michael Landgrebe, takes the reader through the different techniques used to accomplish very demanding tasks such as ice crystals stuck to the skin of Kate Beckinsale…….and all of it done in stereo 3D. The magazine is published in German, so for those of you who don’t speak the language there are some nice before/after images as well.